SVRTC members from thirteen divisions (Amelia, Brunswick, Buckingham, Charlotte, Cumberland, Danville, Hopewell, Lunenburg, Mecklenburg, Nottoway, Prince Edward, Prince George, and Sussex) were present at the first meeting of 2018-19. The meeting included a presentation from Mecklenburg Electric Cooperative (MEC) on an initiative that will bring ultrahigh -speed fiber broadband to many rural areas over the course of three-years. This initiative was made possible through grant funding from the Tobacco Region Revitalization Commission (TRRC). 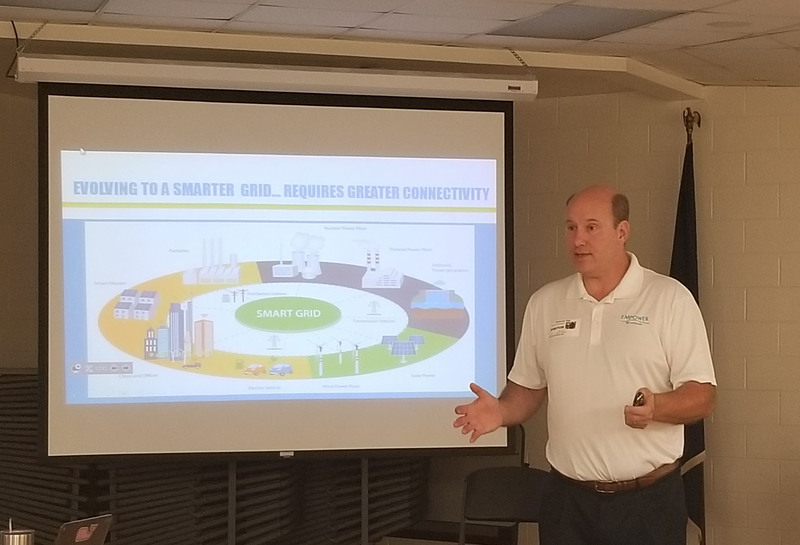 David Lipscomb, Vice President of Member and Energy Services with Mecklenburg Electric Cooperative (MEC) elaborated on the High-Speed Fiber Optic Broadband pilot program during the meeting. He explained that MEC has plans to upgrade the telecommunications infrastructure it utilizes to provide electric distribution service to offer ultrahigh-speed fiber broadband to its members and their communities in Brunswick, Charlotte, Greensville, Halifax, Lunenburg, Mecklenburg, Pittsylvania, Southampton and Sussex and the North Carolina counties of Granville, Person, Northampton, Vance, and Warren. Nine of these are SVRTC divisions. Bill Wilson, Senior Technology Engineer for the SVRTC has worked closely with Mr. Lipcomb during early phases of the project to install and test the fiber optic technology that will be used during a typical home installation. Mr. Wilson stated “The Internet service of this network has far exceeded my expectations. I have tried on numerous occasions to get reliable, adequate, and affordable broadband in our area with little success. I believe we are finally seeing it become a reality.” Mr. Wilson indicated that the service he tested has provided a constant 50 Mbps in download and in upload bandwidth and that he had experienced no buffering or other video issues. “It’s delightful!” he said. During their monthly meeting, the SVRTC stated its support of this last mile fiber optic project that will serve so many of the consortium’s members. It is expected as more and more families come on-line more and more students will benefit from the Internet they may not have had or that did not work well. More details of MEC’s high-speed broadband pilot program including pricing can be found in Mr. Lipscomb’s presentation, Empower Broadband.